Why is Galileo’s Law of Inertia known as Newton’s First Law of Motion? As Sir Isaac Newton was studying motion, he wanted to state things in as general a way as possible. An overriding assumption in science is that the simplest explanation is usu­ally the best explanation. The Law of Inertia is the simplest statement describing the motion of objects. Newton’s other two laws of motion just help describe the Law of Inertia better. The First Law states that an object in motion will remain in motion along a straight line unless acted upon by an outside, unbalanced force. You have learned that the change in motion is called acceleration. A force is a push or a pull. If an unbal­anced force is applied to an object, the object’s acceleration is dependent upon the its mass- the amount of matter that is the object. Let’s say that you have to pull some people around the track in a wagon. On the first trip, the wagon only has one person in it. You pull with a certain force and get her started. Once she is moving, you need only apply a small force to overcome friction. On the second trip, the wagon has four of your friends in it. If you pull with exactly the same force as before, you cannot budge the wagon. To get the second wagon around, you would have to pull harder- apply a greater force. The units of mass and acceleration are Kg and m/s/s, so unit of force is the Kg•m/s/s. Since this is a rather cumbersome unit to use, it is called a Newton (N). 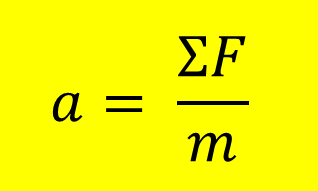 This means that if you wanted to accelerate a 1 Kg object 1 m/s/s, it would require 1 N of force. 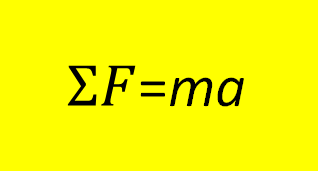 The ΣF in ΣF = ma is the net force. That is, it is the sum of all the forces act­ing on the mass. If we use a person being pulled in a wagon as our example, the net force on the person is just what they are being pulled with. Her weight and the static force pushing up from the wagon cancel each other out. They are equal in magnitude, opposite in direction.